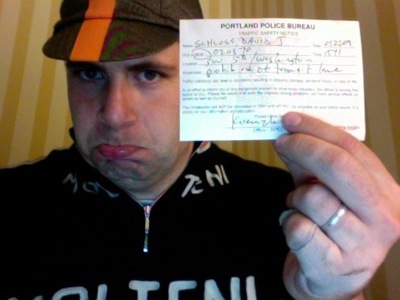 Picked up my favorite biking souvenir the other day here in Portland, a notice from the Portland Police department that I was riding too far to the right in the transit lane. Portland’s redoing the Mall, Fifth and Sixth have been completely overhauled (and will be an utter nightmare when they reopen on the 24th). The cop waved me over as I was in the bus lane. Of course, it’s the bus lane with no busses, as the mall is still closed to mass transit, but the law is the law, and he hit me up with a “notice.” No points or fine, just a dandy little note telling me that they could have fined me. I think I’ll frame this.